Size: Plate is approximately 6.0" X 6.2"
Burnice H. Beane: In 1874, a small nest of crinoid fossils was uncovered in the Le Grand Quarry. They were so well preserved that scientists from Iowa, Illinois, New Mexico, Indiana, and Massachusetts visited the site and with the cooperation of the quarry owner they excavated the fossils over a sixteen year period. Charles Wachsmuth and Frank Springer were two of the scientists that visited the site They patiently answered the questions of a young farm boy, and inspired him with their enthusiasm. Burnice Hartley Beane grew up on a farm at the edge of the Le Grand quarry. In the quiet times, between chores and schoolwork, he found time for his hobby -- collecting insects, bird eggs, rocks, and finally fossils. Beane helped his mother manage the family farm while his father toured the Midwest as an evangelist Quaker minister. They sold their cash crops of strawberries, watermelon and potatoes in Marshalltown and other nearby towns. Beane to attended Penn College in Oskaloosa for a short time and then returned to the family farm near the edge of the quarry. Here he raised his family and continued his interest in the fossils of Le Grand. As an enthusiastic youth, Burnice Beane saved the crinoids of Le Grand from the rock crusher because of his interest in fossils near his home. He added to his growing collection, kept records of his finds and studied the crinoid for over fifty years. Although a farmer by trade many recognized him as an on the fossils of the Le Grand area. Today many other amateurs are following Mr. Beane.s example and responcibly collect fossils for the enjoyment and future research. Le Grand Quarry: In 1909 the ownership of the Le Grand quarry passed to the Chicago and Northwestern Railroad. The quarry produced Crushed stone for road and railway ballast, agricultural lime and building stone for the Old Iowa State Historical Building originated from the quarry. 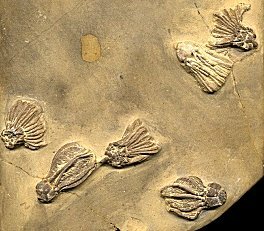 The quarry's most significant product however, is the small flower-like animals, crinoids, that are preserved in the rock. Still interested in the crinoid he continued to maintained close ties with the quarry owner and workers.. Beane's most significant discovery came in 1931 when blasting exposed a cluster of ancient starfish. While workers loaded rock into the crusher, Beane chipped away at the block of stone to reduce it to a manageable weight. Still weighing over 600 pounds, he moved the slab to Beane's farm for study and careful cleaning . Beane, then 52, worked meticulously to uncover the delicate fossils. Upon preparation, the rock yielded the remains of 183 starfish, Schoenaster legrandensis, and a number of other specimens. This find and the care shown it its preparation gained Burnice Beane the interest of paleontologists and gained recognition in the scientific community across the world. Burnice Beane's painstaking skill in preparing the crinoids he saved from the crusher is a scientific legacy. Through his efforts many museums across the world share a portion of Iowa's past. The State Historical Society of Iowa is fortunate to exhibit many of the fossils preserved and prepared by Burnice H. Beane. 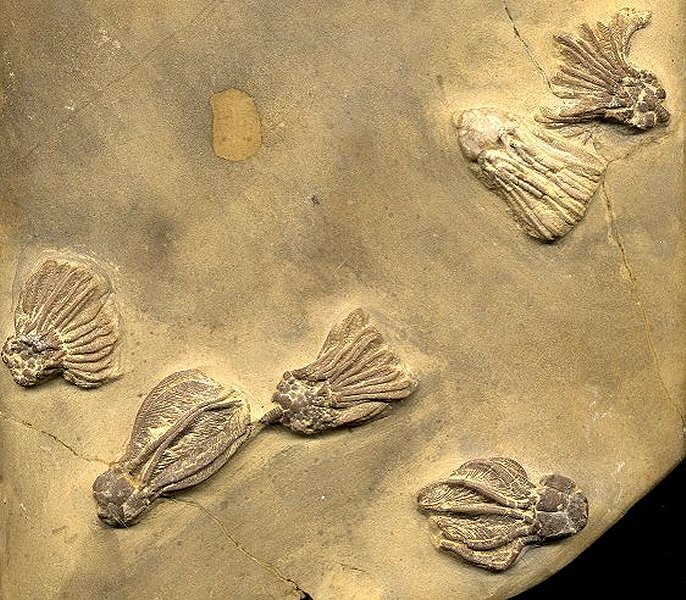 Beane's interest in the Le Grand crinoid continued throughout his life, it filled his house with beautiful fossil slabs and benefited museums and universities around the world. As his fame spread, many paleontologists and amateur collectors sought his advice and an opportunity to tour the famous quarry with the man who had become the guardian of its treasures. This plate contains six excellent crinoids. The large white crinoid in the upper right of the slab is Platycrinites symmetricus (an interesting feature about the crinoids from this site is that the different species of crinoids are different colors!) The plate structure of the cup of this Platycrinites is good, and the biserial arms display the fine pinnules. The rest of the plate showcases three specimens of Rhodocrinus kirbyi and two Strimplecrinus inornatus. All five crinoids exhibit great detail. The very fine pinnulation of the arms is quite evident. Two of the specimens even have some stem attached. The crinoids are very 3-dimensionally preserved, have great color and contrast, and are beautifully spread out about the plate. This fossil was originally acquired from the Central College Museum collection when it was sold off years ago. Beane put hundreds of crinoids into university and museum collections over the years, and this is one of them. The preparation was even done by Beane, and the original label is included with the specimen. Not many fossils have a history as rich as this one!